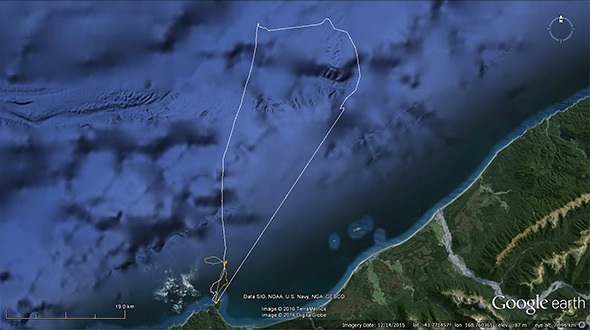 We managed to deploy two more GPS dive loggers on chick-rearing female tawaki. The females are the sole providers of food for their chick while the male guards them. Last year, the females left early in the morning and returned in the afternoon or evening of the same day. In fact, they were very predictable that way. This year, however, the birds seem to return at any time of the day. Data from the first logger deployments also suggest that the birds travel a lot further away from Jackson Head than last year. 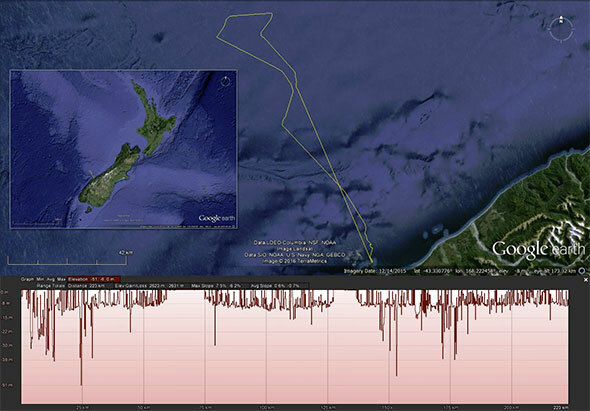 The graph above shows the movement path and dive profile of a 3.5 days foraging trip undertaken by a female tawaki. The bird covered at least 232 km in 85 hours 55 minutes. In order to cover such a great distance, the penguin could not perform a lot of deep dives. 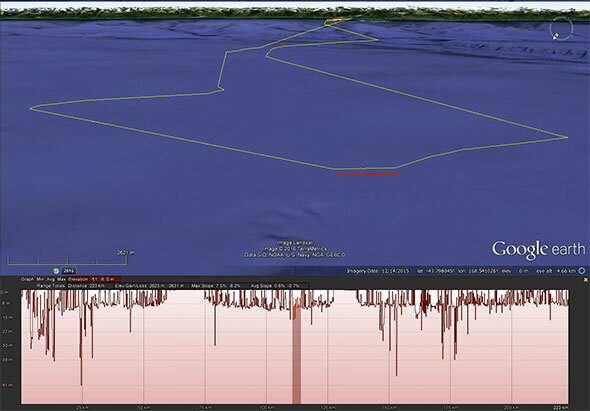 The three dimensional representation of the female’s 3.5 day foraging track underlines the distances the penguins cover while searching for food. The red line indicates the corresponding section in the dive profile. Only when looking at the graph very closely, small wiggles are visible in the line. Those are the individual dives. Hard to see at this scale. But with all this travelling it is safe to say that the penguins are working incredibly hard this year. Unfortunately, it doesn’t seem to be enough. We’ve received word that the situation is similar at other breeding sites on the West Coast. 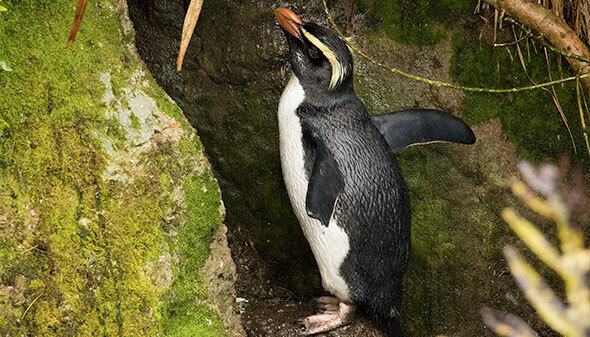 So we’re all a bit concerned what we will find next week when we relocate to Milford Sound. We are enjoying gorgeous weather here on the West Coast while the rest of the country experiences pretty wet conditions. The weather certainly helped us getting three more data loggers on chick-rearing females last night. A georgous sunset over Jackson Head. Putting the devices on proved to be a rather quick job thanks to the fact that we are four people at the moment. In teams of two we could work simultaneously at two sites to start with. And having Klemens Pütz on board also turned out to be a bit of a game changer. Klemens introduced us to a new technique to get penguins off their nests, which is as effective as it is simple. Klemens produced some catching hooks out of 3 mm fence wire he had found in Neils Beach. The contraptions look like primitive shepherd’s crooks – a length 2.5 m length of wire with the end twisted backwards to form a narrow hook. 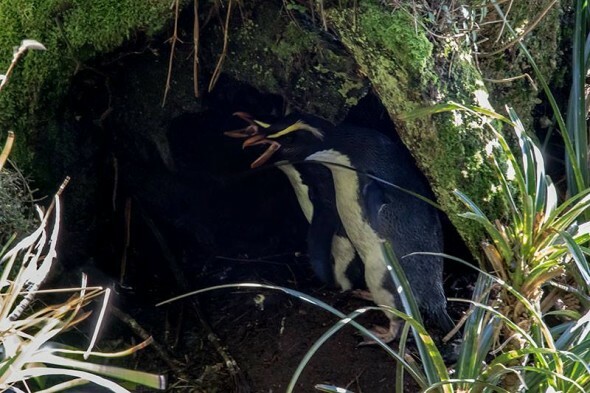 With the hook it is now possible to get penguins out of otherwise inaccessible burrows by gently pulling the birds out on one of their legs. It speeds up the whole process too so that logger deployments can be completed in under 10 minutes. That means a lot less stress for birds as well as researchers. All three logger birds came from nests that seem to do rather well with healthy looking, reasonably fed chicks. Others were not so lucky. Another of our monitored nests failed yesterday where we found a freshly dead chick. When we later examined the stomach content of the small carcass we found a solid block of squid beaks occupying almost two thirds of the organ. 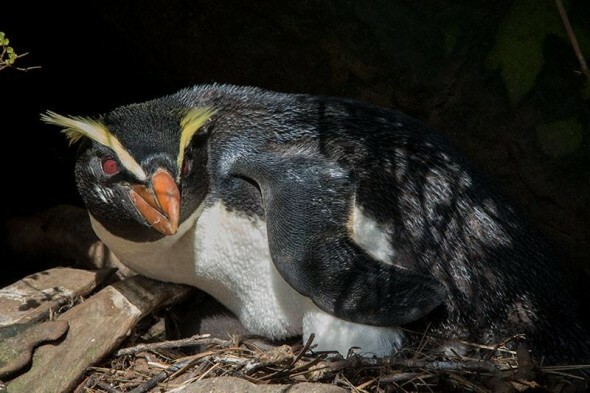 Penguins cannot digest squid beaks easily and either need to break them down by swallowing small stones or just wait until they slowly dissolve. 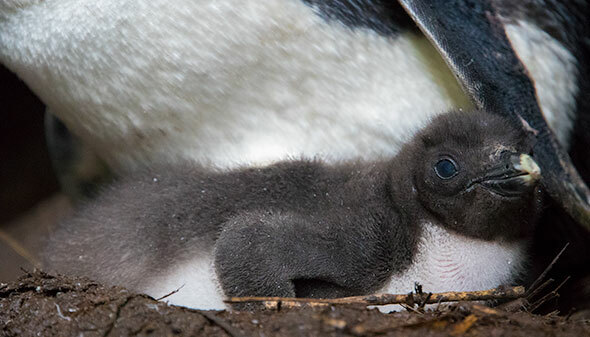 By the looks of it, being fed mainly squid is very bad for the chicks as the beaks quickly accumulate and cause severe constipation that eventually kills the chick. Some of the chicks look quite skinny while others are doing better. 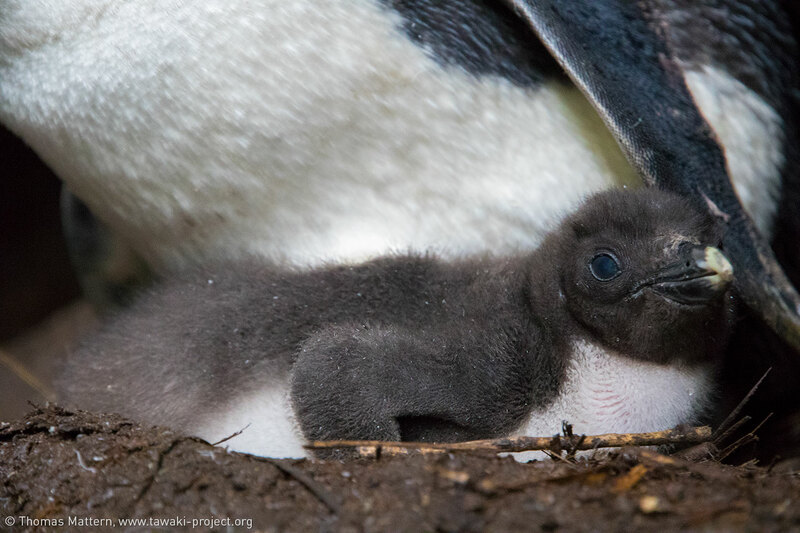 On one of the three nests where we deployed loggers last night, the chick weighed 1.3Kg. The similar sized carcass we collected today was only 300g. 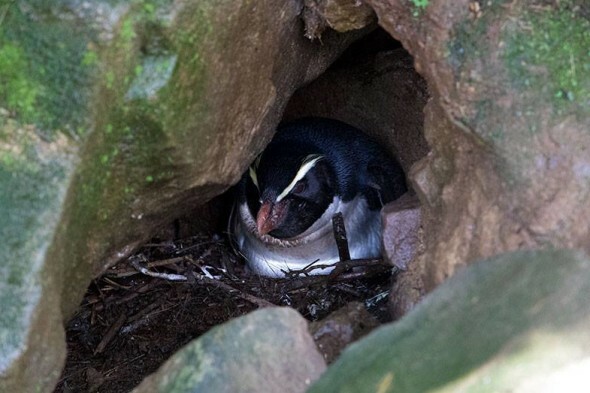 Although it is rather sad to see so many nests fail, it is fortunate that we are here to study the penguins’ foraging behaviour. The data will be so valuable to see how El Niño affects these birds. 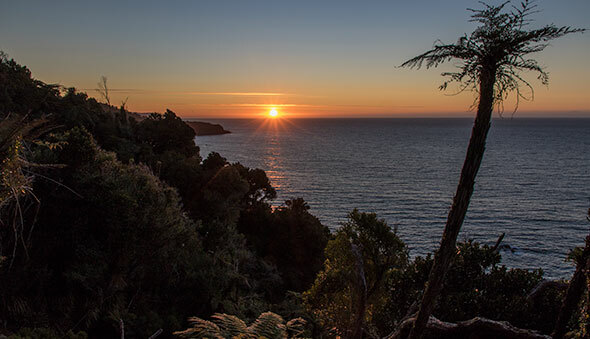 Next year will surely be a lot better again – and so will be the foraging performance by the tawaki of Jackson Head. We managed to get both data loggers back today. 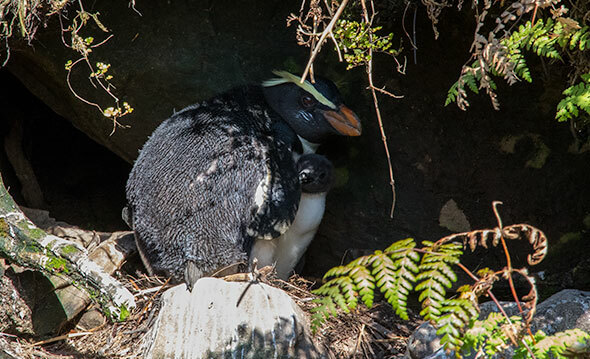 The first bird did what we expected it do during the early chick-rearing phase, and stayed within a 8-km radius of Jackson Head. Unfortunately, she returned to a chick with dead nests as the male had abandonned his post in her absence. We did not know it at the time, but it was already an indication for what is happening here at the moment. 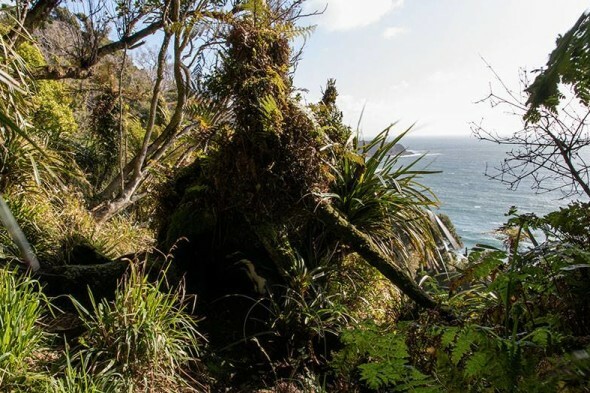 The second female performed two 2-day trips that took here 50km away from Jackson Head. Now, considering that she is caring for a very small chick that needs to be fed frequently, long-term trips are a bad idea. Then again, we are observing a very bad breeding season for tawaki. While last season we counted two failed nests over the entire breeding season, we have already lost in the 8 nests in the week we are here. And it doesn’t seem to stop there. Chicks all over the place look rather small and do not seem to gain much weight. It appears that the feeding situation out there is severely disrupted by El Niño. But it is really admirable how some dads hold the fort while mum is out trying her best to find food for their little ones. Finally a break in the weather. Up until lunchtime we had fish swimming past the living room windows of our Neils Beach domicile. But within half an hour or so it all disappeared and made room for blue skies. And sunshine, actual real sunshine! Miracles do happen! In the morning Ursula and Junishi drove down to Queenstown to pick up Klemens Pütz from the airport. Jun will be heading back to Dunedin. 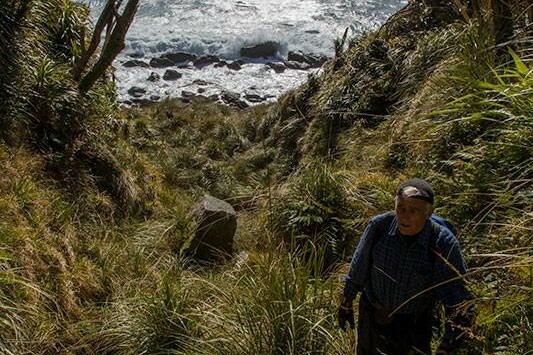 Klemens will take care of the Jackson Head tawaki tracking when we head over to Milford Sound in about two weeks. Hotte and I borrowed a ute from Geoff Robson, the owner of Greenstone Helicopters who has been supporting the Tawaki Project since its beginning. We headed out to Jackson Head after lunch. Over the course of three hours we did a nest check run at Popi’s Plaza and the Hilltop area. No more nest failures to report, which is great! The sun did its thing to make the bush bashing actually an enjoyable past-time. Ursula and Klemens only returned to Neils Beach around 10pm so that we had to scrap the idea of deploying more loggers tonight. However, with Klemens we have a true penguin tracking pioneer in our team so that we can work in two groups and get twice the amount of penguins fitted with loggers in the next few days. We’re swamped down in Neils Beach. 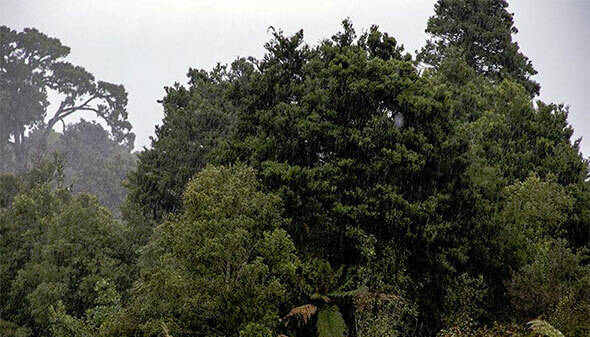 A heavy rainfall warning is in place for Westland with 130mm expected to fall until tonight. 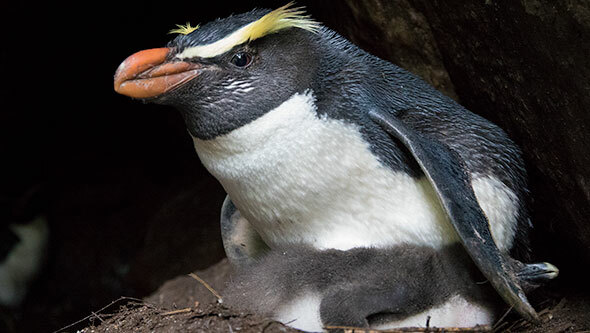 Not good news for us – and probably not good news for the penguins either. Around midday a gap in the clouds opened up and the sun even peeped through it for a moment. But when it counted – in the evening – the rain returned with full force and reached almost biblical proportions. Deploying data loggers in these conditions is really difficult. The adhesive side of the tape we use to attach the devices to the penguins will inevitably get wet and won’t stick that well. Once the tape is stuck to the devices it can withstand weeks in ocean water. But use damp tape during deployment and you have a recipe for disaster. 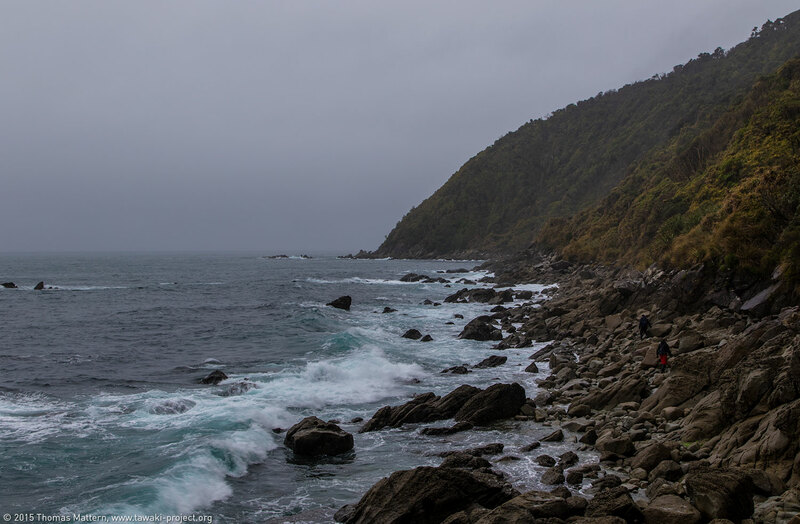 On top of that a tsunami warning after the earthquake in Chile, rough seas and swollen creeks made it simply impossible to reach the tawaki colonies of Jackson Head. We called off today’s nest searches for obvious reasons. 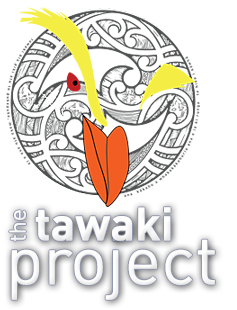 We will still try to get the first set of data loggers deployed on willing tawaki tonight. With breeding further advanced than we’d hoped, we haven’t got any time to waste. The weather wasn’t on our side this morning with heavy rainfall throughout most of the day. 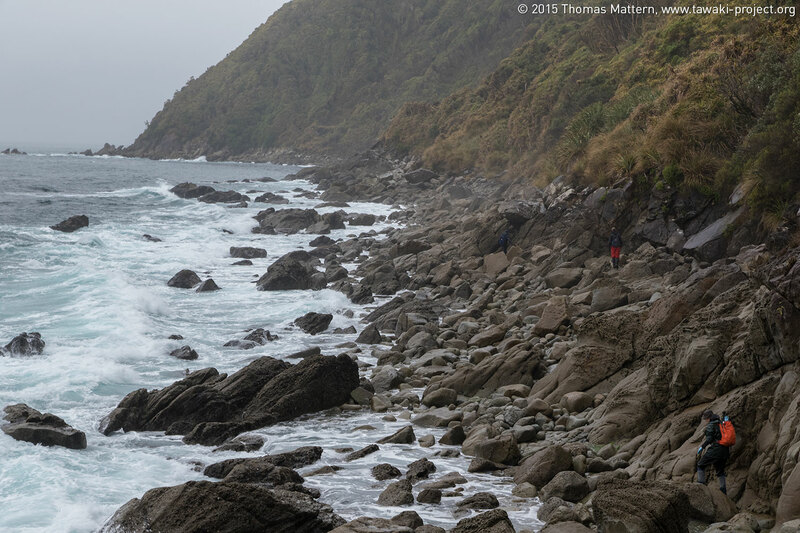 Nevertheless, we used a break in the weather to head out to Jackson Head after dinner tonight. 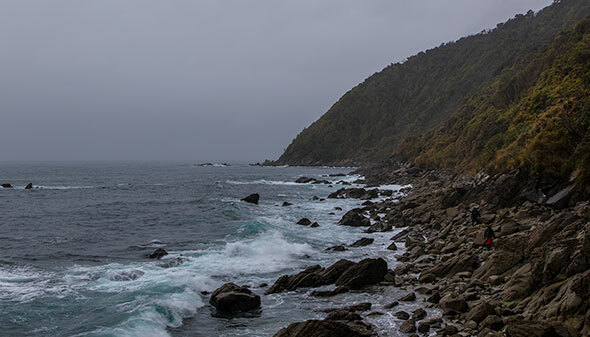 Armed with three GPS logger/TDR packs we made our way along the coast to a site we call “Popi’s Plaza” (named after Popi Garcia-Borboroglu, president of the Global Penguin Society, who’s discovered it). It’s densely vegetated with kiekie and bush lawyer, two plants that drive humans crazy because it’s so easy to get entangled in the former and ripped to shreds by the thorns of the latter. 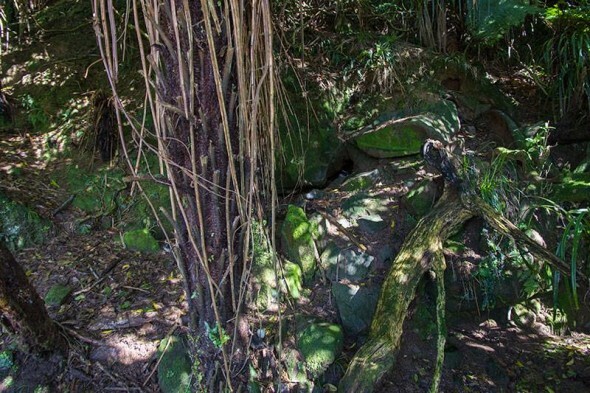 Once you have struggled through the nasty stuff, you’ll reach broadleaf forest where some tawaki breed in small caves and crevisses in a steep bank. Although we had only found six nests here the day before, three of these were quite suitable for our tracking study. 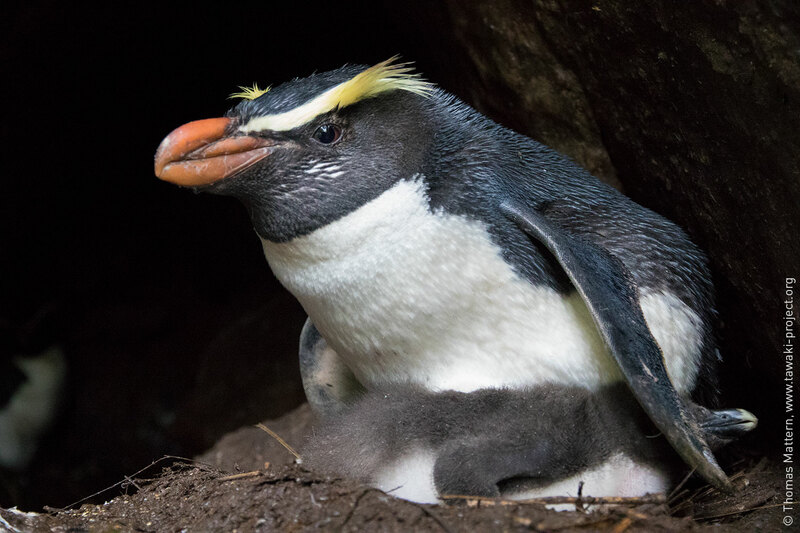 We managed to deploy devices on the female penguins at the first two nests, but unfortunately found that our third potential logger nest had not survived the day of heavy rain. Seeing a mother guarding her lifeless chick put a spotlight on the reality of El Niño this year. 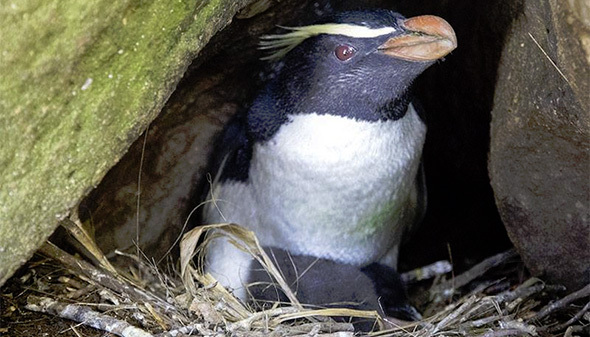 Last year, two of 30 nests we monitored failed. This year we haven’t even looked at more then 20 nests and four are gone already. So although nest numbers initially were comparable to last year, we’re losing nests at a higher rate. First full day in the Jackson Head bush. As can be expected at the West Coast it turned out to be rather wet. 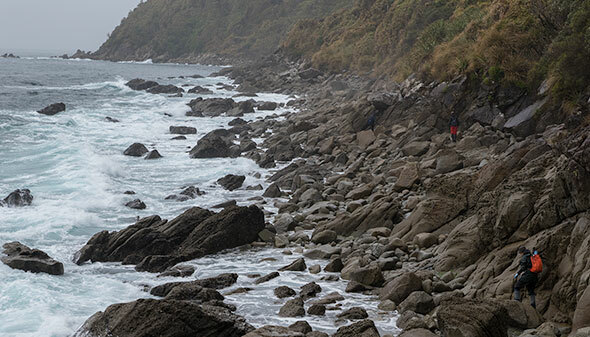 And of course our timing walking in was impeccable at almost high tide, making clambering along the rocks a fun thing to do. 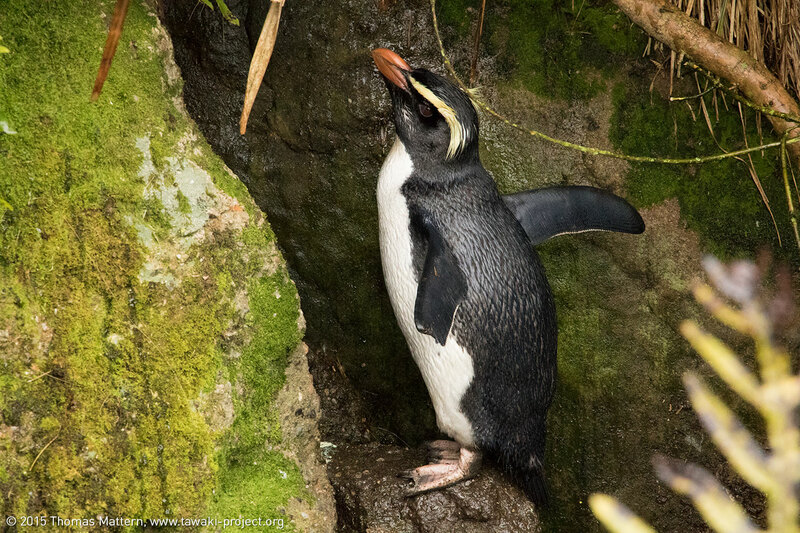 Once we reached the tawaki breeding sites we checked most of last season’s nests and observed quite a few changes. A bit of nest site shuffling seems to have occurred. Some nest sites remain empty this season, while new nests have been established in spots that had no users last year. Especially the apartment building, the site where most of the documentary filming happened last year, looked rather empty with a mere 4 nests where we had 9 last year. An old fried is hodling the Fort at the apartment Building – the balcony bird is back! Speaking of the apartment building. It was quite nice to see our old friend again, the male tawaki from the balcony nest. Last year he turned out to be a rather inquisitive chap ready to defend his chicks if somebody poked their nose to closely into the nest. Because of the nice natural lighting in the nest, he also became the star of the documentary. But overall nest numbers appear down compared with last year. The El Niño effect, perhaps? Also breeding seems more advanced when compared to last season. All nests we looked at had chicks in them, a few of them have already failed. In fact, in one nest I noticed a rather large chick by itself indicating that some birds have already gone into the post-guard stage. Oh, and I spotted a penguin with quite a bit of its left flipper missing. We’ll call him Jamie Lannister. Just goes to show how tough these birds are and can indeed survive grueling injuries without human intervention. After four hours of bush bashing we made it back to our base at Neils Beach. All pretty tired. The many weeks of desk work certainly take their toll. We hope to deploy the first dive loggers today. If only the weather improves a bit (no rain please).